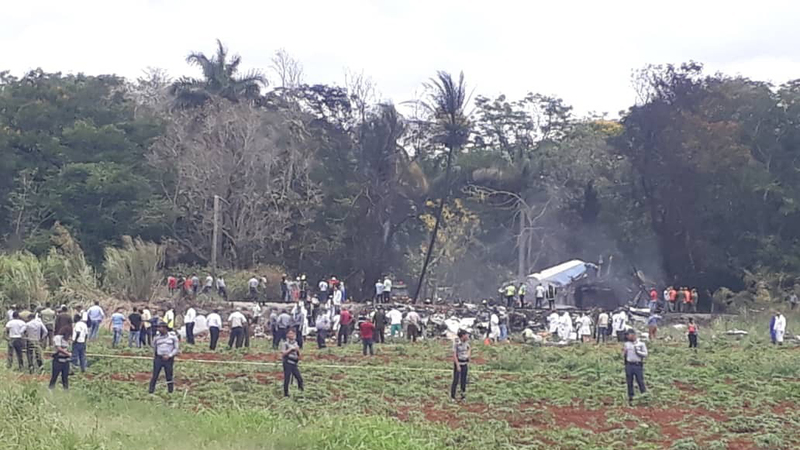 More Than 100 Feared Dead After Plane Crashes Near Havana Airport : The Two-Way The Boeing 737 crashed midday Friday near José Martí International Airport. "There is a high number of people who appear to have died," Cuban President Miguel Mario Díaz-Canel Bermúdez said. First responders and law enforcement gather in the field where an airliner crashed after takeoff Friday, just outside the international airport in Havana, Cuba. A plane carrying more than 100 people crashed shortly after takeoff from Havana's José Martí International Airport. The plane, a Boeing 737, had been destined for the city of Holguín when it smashed into the wooded edge of a field midday Friday. The official Granma news agency says at least 105 passengers were aboard the domestic flight along with nine crew members. Just three people survived the crash, according to the Cuban government. The survivors have been hospitalized in critical condition, Granma reports. Cuban officials did not immediately release information regarding what caused the crash, but they have pledged to launch an investigation into the incident. Firefighters worked to extinguish the blaze that broke out among the wreckage, according to local media, which note that the plane appeared burned and blackened. Witnesses reported having seen spiraling columns of black smoke rising from the crashed plane. Cuba's newly inaugurated president, President Miguel Mario Díaz-Canel Bermúdez, rushed to the site of the crash along with other government officials. "There is a high number of people who appear to have died," Diaz-Canel told Cuba's state-run broadcaster at the scene. "In the name of the Cuban government and the party, we also mourn and we raise condolences to the families who may be affected by this tragic accident." The country's state-run airline, Cubana, had been renting the plane from the Mexico-based firm Global Air, also known as Damojh Airlines, according to the Aviation Safety Network. As NPR's Carrie Kahn explains, "Cubana Airlines has been renting planes since many of its aging aircraft have been taken out of service in recent months due to mechanical problems." The safety database adds that the plane Cubana was renting was over 38 years old. Boeing, the plane's manufacturer, noted that it is "aware of news reports out of Cuba and [is] closely monitoring the situation."